Desmond Tutu Backs Britain's 'Assisted Dying' Bill : The Two-Way The retired Anglican bishop said the end of former South African President Nelson Mandela's life robbed him of his dignity. Archbishop Desmond Tutu, who was awarded the Nobel Peace Prize for his part in fighting apartheid, photographed in India in 2012. Retired Anglican bishop Desmond Tutu, who describes as "disgraceful" the way former South African President Nelson Mandela was treated in his last, enfeebled days, has thrown his support behind a British assisted-dying bill. "I have been fortunate to spend my life working for dignity for the living. 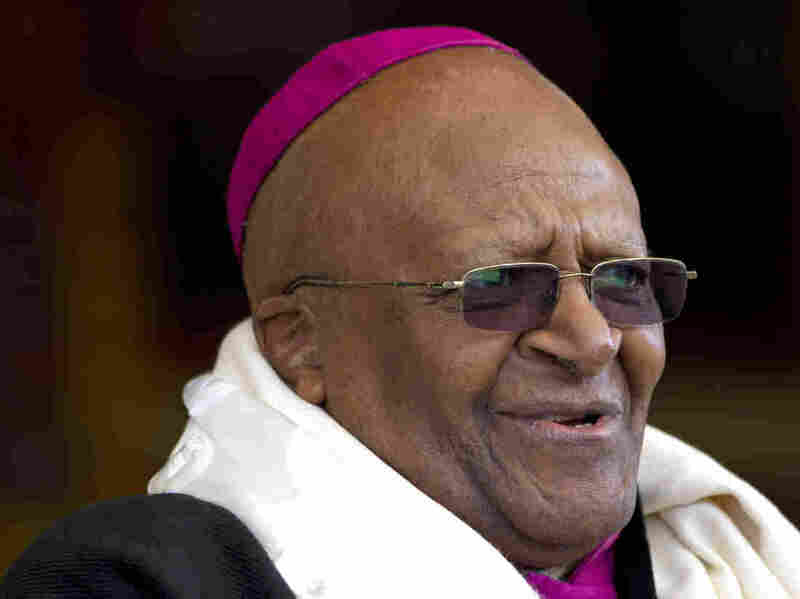 Now I wish to apply my mind to the issue of dignity for the dying," the archbishop emeritus of Cape Town and anti-apartheid leader wrote in an editorial in The Observer. "I revere the sanctity of life — but not at any cost," he said. Tutu, a fellow activist and longtime friend of Mandela's, whom he calls by his tribal name, Madiba, says the end of the former South African president's life robbed him of his dignity. Mandela, who served 27 years in jail for his anti-apartheid activity and later became South Africa's first black president, died in December at age 95 after a prolonged lung infection that left him incapacitated for many months. "There was that occasion when Madiba was televised with political leaders, President Jacob Zuma and Cyril Ramaphosa. You could see Madiba was not fully there. He did not speak. He was not connecting. My friend was no longer himself. It was an affront to Madiba's dignity," Tutu writes. "On Mandela Day we will be thinking of a great man," he said. "On the same day, on 18 July 2014 in London, the House of Lords will be holding a second hearing on Lord Falconer's bill on assisted dying. Oregon, Washington, Quebec, Holland, Switzerland have already taken this step. South Africa has a hard-won constitution that we are proud of that should provide a basis to guide changes to be made on the legal status of end-of-life wishes to support the dignity of the dying." Tutu, 82, who was hospitalized last year for a persistent infection, also writes of his own death. "I have come to realise that I do not want my life to be prolonged artificially," he said. "I think when you need machines to help you breathe, then you have to ask questions about the quality of life being experienced and about the way money is being spent." The Nobel Peace Prize laureate said he wants to be cremated in a simple wooden coffin. "My memorial stone should also be modest," he said. "My concern is not just about affordability; it's my strong preference that money should be spent on the living."